ProHance (Gadoteridol) Injection is a nonionic contrast medium for magnetic resonance imaging (MRI), available as a 0.5M sterile clear colorless to slightly yellow aqueous solution in vials and syringes for intravenous injection. ProHance has an osmolality 2.2 times that of plasma (285 mOsmol/kg water) and is hypertonic under conditions of use. The pharmacokinetics of intravenously administered gadoteridol in normal subjects conforms to a two-compartment open model with mean distribution and elimination half-lives (reported as mean ± SD) of about 0.20 ± 0.04 hours and 1.57 ± 0.08 hours, respectively. Gadoteridol is eliminated in the urine with 94.4 ± 4.8% (mean ± SD) of the dose excreted within 24 hours post-injection. It is unknown if biotransformation or decomposition of gadoteridol occur in vivo. The renal and plasma clearance rates (1.41 ± 0.33 mL/ min/kg and 1.50 ± 0.35 mL/ min/kg, respectively) of gadoteridol are essentially identical, indicating no alteration in elimination kinetics on passage through the kidneys and that the drug is essentially cleared through the kidney. The volume of distribution (204 ± 58 mL/kg) is equal to that of extracellular water, and clearance is similar to that of substances which are subject to glomerular filtration. Following GBCA administration, gadolinium is present for months or years in brain, bone, skin, and other organs (See WARNINGS- Gadolinium Retention). It is unknown if protein binding of ProHance occurs in vivo. In magnetic resonance imaging (MRI), visualization of normal and pathologic brain tissue depends in part on variations in the radiofrequency signal intensity that occur with 1) differences in proton density; 2) differences of the spin-lattice or longitudinal relaxation times (T1); and 3) differences in the spin-spin or transverse relaxation time (T2). When placed in a magnetic field, gadoteridol decreases T1 relaxation times in the target tissues. At recommended doses, the effect is observed with greatest sensitivity in the T1-weighted sequences. Disruption of the blood-brain barrier or abnormal vascularity allows accumulation of gadoteridol in lesions such as neoplasms, abscesses, and subacute infarcts. The pharmacokinetics of ProHance in various lesions is not known. ProHance was evaluated in two blinded read trials in a total of 133 adults who had an indication for head and neck extracranial or extraspinal magnetic resonance imaging. These 133 adults (74 men, 59 women) had a mean age of 53 with a range of 19 to 76 years. Of these patients, 85% were Caucasian, 13% Black, 2% Asian, and < 1% other. The results of the non-contrast and gadoteridol MRI scans were compared. In this database, approximately 75-82% of the scans were enhanced. 45-48% of the scans provided additional diagnostic information, and 8-25% of the diagnoses were changed. The relevance of the findings to disease sensitivity and specificity has not been fully evaluated. ProHance was evaluated in a multicenter clinical trial of 103 children who had an indication for a brain or spine MRI. These 103 children, (54 boys and 49 girls) had a mean age of 8.7 years with an age range of 2 to 20 years. Of these 103 children, 54 were between 2 and 12 years of age. Also, of these 103 children, 74% were Caucasian, 11% Black, 12% Hispanic, 2% Asian, and 2% other. The results of the non-contrast and gadoteridol MRI scans were compared. ProHance was given in one single 0.1 mmol/kg dose. Repeat dosing was not studied. In this database, MRI enhancement was noted in approximately 60% of the scans and additional diagnostic information in 30-95% of the scans. ProHance (Gadoteridol) Injection is indicated for use in MRI in adults and children over 2 years of age to visualize lesions with abnormal vascularity in the brain (intracranial lesions), spine and associated tissues. ProHance is contraindicated in patients with known allergic or hypersensitivity reactions to ProHance (see WARNINGS). Gadolinium-based contrast agents (GBCAs) increase the risk for nephrogenic systemic fibrosis (NSF) among patients with impaired elimination of the drugs. Avoid use of GBCAs among these patients unless the diagnostic information is essential and not available with non-contrast enhanced MRI or other modalities. The GBCA-associated NSF risk appears highest for patients with chronic, severe kidney disease (GFR <30 mL/min/1.73m2) as well as patients with acute kidney injury. The risk appears lower for patients with chronic, moderate kidney disease (GFR 30-59 mL/min/1.73m2) and little, if any, for patients with chronic, mild kidney disease (GFR 60-89 mL/min/1.73m2). NSF may result in fatal or debilitating fibrosis affecting the skin, muscle and internal organs. Report any diagnosis of NSF following ProHance administration to Bracco Diagnostics (1-800-257-5181) or FDA (1-800-FDA-1088 or www.fda.gov/medwatch). Among the factors that may increase the risk for NSF are repeated or higher than recommended doses of a GBCA and the degree of renal impairment at the time of exposure. Record the specific GBCA and the dose administered to a patient. For patients at highest risk for NSF, do not exceed the recommended ProHance dose and allow a sufficient period of time for elimination of the drug prior to re-administration. For patients receiving hemodialysis, physicians may consider the prompt initiation of hemodialysis following the administration of a GBCA in order to enhance the contrast agent’s elimination. The usefulness of hemodialysis in the prevention of NSF is unknown (see CLINICAL PHARMACOLOGY and DOSAGE AND ADMINISTRATION). Deoxygenated sickle erythrocytes have been shown in in vitro studies to align perpendicular to a magnetic field which may result in vaso-occlusive complications in vivo. The enhancement of magnetic moment by ProHance may possibly potentiate sickle erythrocyte alignment. ProHance in patients with sickle cell anemia and other hemoglobinopathies has not been studied. Patients with other hemolytic anemias have not been adequately evaluated following administration of ProHance to exclude the possibility of increased hemolysis. Consequences of gadolinium retention in the brain have not been established. Pathologic and clinical consequences of GBCA administration and retention in skin and other organs have been established in patients with impaired renal function (See WARNINGS-Nephrogenic Systemic Fibrosis). There are rare reports of pathologic skin changes in patients with normal renal function. Adverse events involving multiple organ systems have been reported in patients with normal renal function without an established causal link to gadolinium retention (See ADVERSE REACTIONS). Diagnostic procedures that involve the use of contrast agents should be carried out under direction of a physician with the prerequisite training and a thorough knowledge of the procedure to be performed. Personnel trained in resuscitation techniques and resuscitation equipment should be available. The possibility of a reaction, including serious, life threatening, or fatal, anaphylactic or cardiovascular reactions, or other idiosyncratic reactions (see ADVERSE REACTIONS), should always be considered, especially in those patients with a history of a known clinical hypersensitivity or a history of asthma or other allergic respiratory disorders. Gadoteridol is cleared from the body by glomerular filtration. The hepato-biliary enteric pathway of excretion has not been demonstrated with ProHance. Dose adjustments in renal or hepatic impairment have not been studied. Therefore, caution should be exercised in patients with either renal or hepatic impairment. In a patient with a history of grand mal seizure, the possibility to induce such a seizure by ProHance is unknown. When ProHance (Gadoteridol) Injection is to be injected using nondisposable equipment, scrupulous care should be taken to prevent residual contamination with traces of cleansing agents. After ProHance is drawn into a syringe, the solution should be used immediately. Repeat Procedures: Repeated procedures have not been studied. Sequential use during the same diagnostic session has only been studied in central nervous system use. (See Pharmacokinetics under CLINICAL PHARMACOLOGY and Central Nervous System under DOSAGE AND ADMINISTRATION). has recently received a GBCA. Gadolinium Retention: Advise patients that gadolinium is retained for months or years in brain, bone, skin, and other organs in patients with normal renal function. The clinical consequences of retention are unknown. Retention depends on multiple factors and is greater following administration of linear GBCAs than following administration of macrocyclic GBCAs. (See WARNINGS-Gadolinium Retention). ProHance did not demonstrate genotoxic activity in bacterial reverse mutation assays using Salmonella typhimurium and Escherichia coli, in a mouse lymphoma forward mutation assay, in an in vitro cytogenetic assay measuring chromosomal aberration frequencies in Chinese hamster ovary cells, nor in an in vivo mouse micronucleus assay at intravenous doses up to 5.0 mmol/kg. GBCAs cross the placenta and result in fetal exposure and gadolinium retention. The human data on the association between GBCAs and adverse fetal outcomes are limited and inconclusive. Because of the potential risks of gadolinium to the fetus, use ProHance only if imaging is essential during pregnancy and cannot be delayed. ProHance administered to rats at 10 mmol/kg/day (33 times the maximum recommended human dose of 0.3 mmol/kg or 6 times the human dose based on a mmol/m2 comparison) for 12 days during gestation doubled the incidence of postimplantation loss. When rats were administered 6.0 or 10.0 mmol/ kg/day for 12 days, an increase in spontaneous locomotor activity was observed in the offspring. ProHance increased the incidence of spontaneous abortion and early delivery in rabbits administered 6 mmol/ kg/day (20 times the maximum recommended human dose or 7 times the human dose based on a mmol/m2 comparison) for 13 days during gestation. The adverse events described in this section were observed in clinical trials involving 1251 patients (670 males and 581 females). Adult patients ranged in age from 18-91 yrs. Pediatric patients ranged from 2-17 years. The racial breakdown was 83% Caucasian, 8% Black, 3% Hispanic, 2% Asian, and 1% other. In 2% of the patients, race was not reported. The most commonly noted adverse experiences were nausea and taste perversion with an incidence of 1.4%. These events were mild to moderate in severity. General Disorders and Administration Site Conditions: Adverse events with variable onset and duration have been reported after GBCA administration (See WARNINGS-Gadolinium Retention). These include fatigue, asthenia, pain syndromes, and heterogeneous clusters of symptoms in the neurological, cutaneous, and musculoskeletal systems. Body as a Whole: Generalized Edema; Laryngeal Edema; Malaise; Anaphylactoid Reactions (characterized by cardiovascular, respiratory and cutaneous symptoms, and rarely resulting in Death). Cardiovascular: Cardiac Arrest; Bradycardia; Hypertension; and Death in association with pre-existing cardiovascular disorders. ADULTS: The recommended dose of ProHance (Gadoteridol) Injection is 0.1 mmol/kg (0.2 mL/kg) administered as a rapid intravenous infusion (10 mL/min-60 mL/min) or bolus (> 60 mL/min). In patients with normal renal function suspected of having poorly enhancing lesions, in the presence of negative or equivocal scans, a supplementary dose of 0.2 mmol/kg (0.4 mL/kg) may be given up to 30 minutes after the first dose. CHILDREN (2-18 years): The recommended dose of ProHance is 0.1 mmol/kg (0.2 mL/kg) administered as a rapid intravenous infusion (10 mL/min-60 mL/min) or bolus (> 60 mL/min). The safety and efficacy of doses > 0.1 mmol/kg, and sequential and/or repeat procedures has not been studied. ADULTS: The recommended dose of ProHance is 0.1 mmol/kg (0.2 mL/kg) administered as a rapid intravenous infusion (10 mL/min-60 mL/min) or bolus (> 60 mL/min). CHILDREN: Safety and efficacy for extracranial/extra-spinal tissues has not been established. Dose adjustments in renal and liver impairment have not been studied. To ensure complete injection of the contrast medium, the injection should be followed by a 5 mL normal saline flush. The imaging procedure should be completed within 1 hour of the first injection of ProHance (Gadoteridol) Injection. 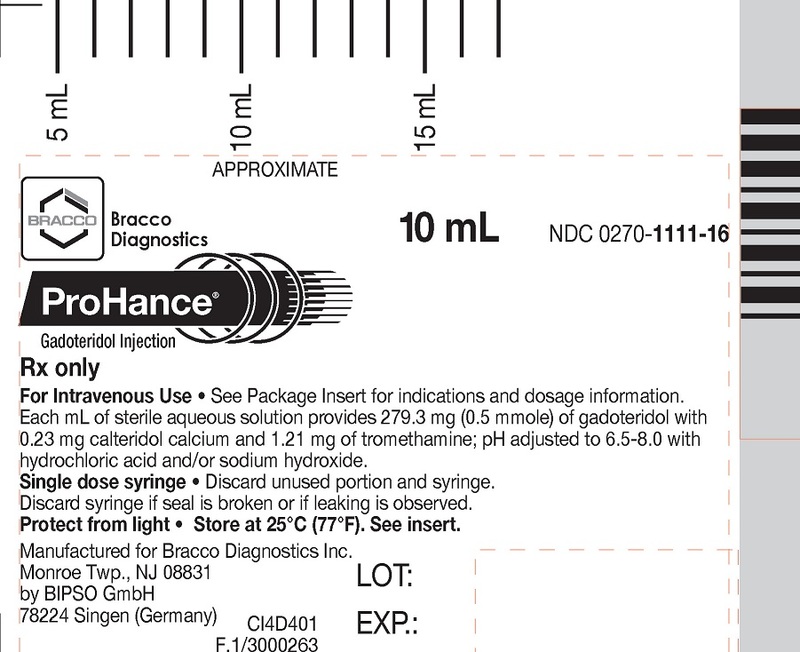 ProHance (Gadoteridol) Injection should be stored at 25°C (77°F) excursions permitted to 15-30°C (59-86°F) [See USP Controlled Room Temperature]. Protect from light. DO NOT FREEZE. Should freezing occur in the vial, ProHance should be brought to room temperature before use. If allowed to stand at room temperature for a minimum of 60 minutes, ProHance (Gadoteridol) Injection should return to a clear, colorless to slightly yellow solution. Before use, examine the product to assure that all solids are redissolved and that the container and closure have not been damaged. Should solids persist, discard vial. Frozen syringes should be discarded. Screw the threaded tip of the plunger rod clockwise into the cartridge plunger and push forward a few millimeters to break any friction between the cartridge plunger and syringe barrel. Holding syringe erect, unscrew the plastic tip cap from the tip of the syringe and attach either a sterile, disposable needle or tubing with a compatible luer lock using a push-twist action. Hold the syringe erect and push plunger forward until all of the air is evacuated and fluid either appears at the tip of the needle or the tubing is filled. Following the usual aspiration procedure, complete the injection. To ensure complete delivery of the contrast medium, the injection should be followed by a normal saline flush. Properly dispose of the syringe and any other materials used. *The syringe assembly is a HYPAK SCF® single dose syringe supplied by Becton Dickinson. U.S. Patent No. 5,474,756; U.S. Patent No. 5,846,519; and U.S. Patent No. 6,143,274.